The fire burns low. Happily dancing yellow flames long ago gave way to the deep orange-red of glowing embers. The heat is satisfying as is the sounds of pop, hiss and crackle coming from the campfire...The only sound that disturbs the silence of the deep Flinders Ranges night. I sit comfortable and content, legs outstretched to the fiercely-hot fire happy within the cocoon of heat it radiates and stare into the hypnotic fire as if within it I could find the answer to...Well, to everything there ever was. It's not there of course, the answer to everything is not something any human will ever know, or should ever know. We finished dinner a couple of hours ago, a simple meal cooked on the same fire I now sit beside, and cleaned up just as the sun sank below the horizon. We always stop to watch for those early risers, the first stars that pop glimmering in the sky as it darkens, and then hurriedly completed the chores eager to take our seats for the show about to start. The greatest show on earth, and off it too. It's cold, enough to need gloves and a beanie when away from the fire; Nights can be brutally cold out here and once away from the cocoon of heat emanating from the fire dew is quick to settle on us blanketing our shoulders and heads like a crown of diamonds. A shift into a more comfortable position on my camping chair is a good opportunity to reach for my steaming coffee and take a sip. I take a deep breath filling my lungs with the clear, crisp air and glance over at my wife. She hates the cold. She looks like an eskimo huddled there in beanie, scarf, gloves and Driza-bone oilskin coat but she flashes her pirate smile and for an instant I see flames dancing provocatively in her eyes; The devil, or just devilish...? That scene is one we have starred in many times. I suppose it's one you may not understand unless you have done it though. Many people don't like camping, or don't have the opportunity to do it, and so may never understand, or value, the purity of it. There is something raw and unadulterated about that moment when the camp chores are done, the fire burns low and the stars come out to play. It's magical and it always makes me feel small, incredibly small and insignificant. 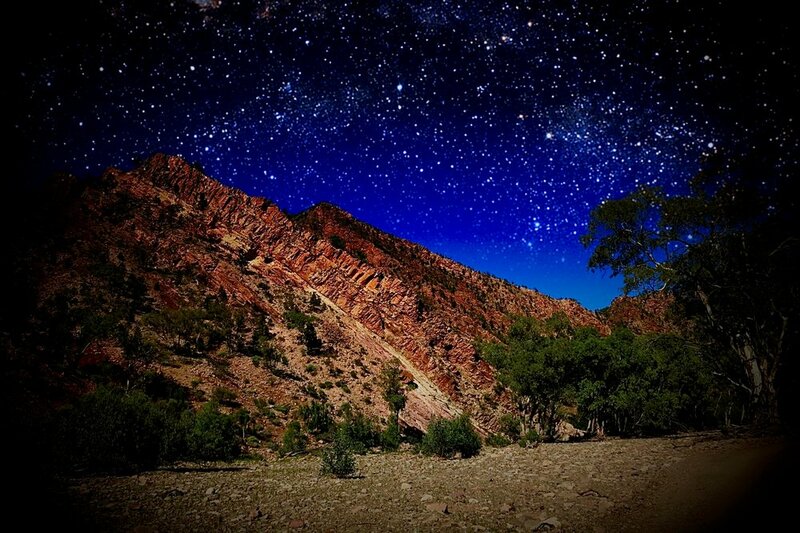 The main image above shows a section of Brachina Gorge in the Flinders Ranges, South Australia. It's almost 500km north from the city of Adelaide and it's remote location and lack of people and infrastructure means it is dark at night, and quiet...Dark is when the stars are the best of course and we make the most of it. This rock formation and gorge itself is old. The rocks in Brachina Gorge were previously sediments deposited in the shallow, elongate basin called the Adelaide Geosyncline some 650 to 500 million years ago. Over the subsequent millions of years mountain-formation occurred and now...Well, it's one of my favourite places to go camping. It feels Primordial in the day time and at night even more so. As I said, it's dark, and when we camp there we're often the only people around. Perfect. It can be spooky but I'm comfortable in the dark and have been in far worse, and inhospitable, places in the dead of night. This place holds no fear for me, and my wife...Well, she has me there so it's all good. During the day we hike and occupy ourselves with reading, writing and some painting here and there. My wife paints, not me. I also test my survival skills in various ways; Things like lighting fire without matches or lighters, building traps and snares, tracking game and the like. We also jump in our off roader and hit the tracks as well. There's plenty to do and not doing anything is time well-spent also. At night it's time for star-gazing and deep conversation, or simple silence. It's a special time and considering the silence the location affords, the billions of stars overhead and the primal feel of the area it makes for the ideal place to reflect and connect. 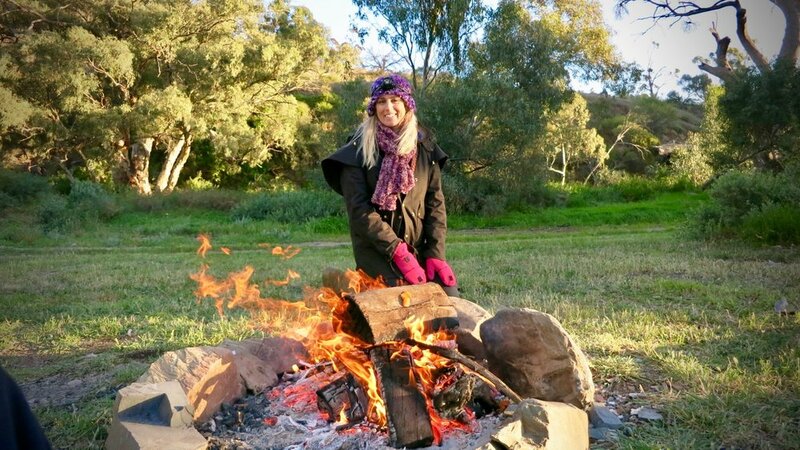 The image above shows Faith my devil-wife [shh, don't tell her I called her that] beside one of our campfires in beanie, scarf, gloves and oilskin coat. This one was not taken at night obviously, but you can see that I'm serious about fire right? I normally get the fire going around 5pm, sometimes earlier when it's really cold, which means it's ready to cook on by around 6pm. We then stoke it up with some good wood and get it roaring until full-dark when we allow it to die down for the light-show above. Watching those stars, finding the constellations and calling out the shooting stars is simply magical. Again, you won't get it if you've never done it. The image above right is a section of the Southern Flinders Ranges, a little to the south of Brachina Gorge, another favourite spot of ours. Do you see that track? 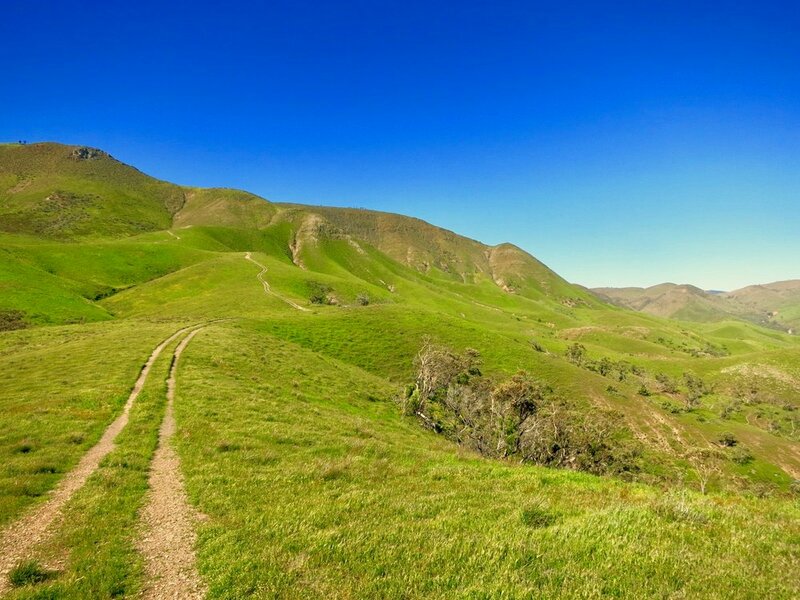 It leads all the way into the distance and to the very top of this mountain range. It's not a difficult four wheel drive track but in places is serious enough that it'll send you plummeting to your death if you get it wrong. OK, it's pretty serious I guess. Some skills are required. I'm fortunate to have a partner with an adventurous side. She is just as comfortable sleeping under 5 stars at a hotel or millions of them in the outback. We have spent so many amazing moments in each other's company and many of those have been whilst camping in the remote areas of Australia. Being so far away from other people can feel a little frightening for some and it's not necessarily something one should be doing with no preparation or skills. However, it's rewarding and can allow one the distance from modern society that is required to just be still and to listen to oneself and the plant that hosts us. Out here, places like this, is where true peace is found. My wife and I have been fortunate enough to have experienced many amazing moments all around the world and yet we count camping in the remote places of Australia as equal amongst even the most amazing of locations. Out there, in the peaceful serenity one gets from being a long way from everyone else, we find perfection...Well, perfect enough as perfection isn't attainable.